Originally an advertising and design company, FunctionFox turned to producing web-based software solutions in 2001. Based in Canada, FunctionFox employs a dedicated team of developers, sales, service, and operational staff. The company focus is on providing simple and secure software as a service (SaaS) tools to creative companies, independent contractors, and small businesses around the world. Intended to improve the productivity and profitability of smaller teams in the creative industries, FunctionFox is a web-based project management software that provides users with online timesheet and expense tracking tools through a simple, easy-to-use interface. FunctionFox is available at three different price points as a monthly subscription service, providing the level of service you need for the size of your business. All of FunctionFox’s online timesheet services come with free customer support and a stopwatch timer, and these services can support unlimited clients and projects. This expense tracking solution is able to produce project costs, estimates, and quote for invoicing. FunctionFox also has an iPhone App and Mac widget for use on the go. This expense tracking system is trusted by tens of thousands of users in well over 100 countries to boost billable hours, prioritize projects, keep team members informed, and provide better business understanding through generated reports. 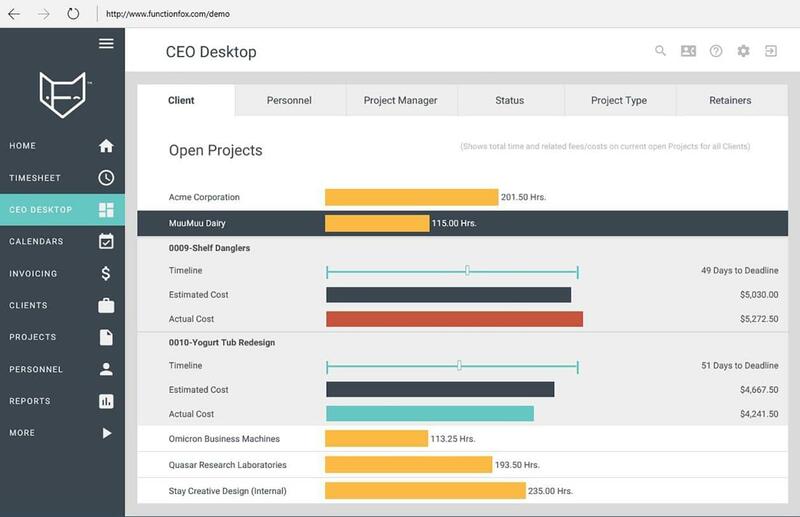 See more of the best project management software in our Project Management Product Selection Tool. Have questions? Call, click, or email to speak with an unbiased Technology Advisor for a no-cost, no-obligation consultation on your unique requirements. Learn everything you need to know about FunctionFox. Our experts will reach out to you shortly.